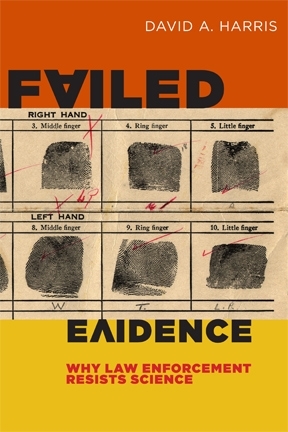 Failed Evidence: Why Law Enforcement Resists Science (NYU Press) is a direct challenge to police and prosecution leadership that has failed to come to grips with the insights that science has supplied for routine types of traditional police work. We’ve all heard about the DNA-based exonerations of innocent people: almost 300 over the last two decades. Failed Evidence starts with this topic, but pushes further. There is now plenty of science about the basic things that go wrong in eyewitness identifications, in suspect interrogations, and in forensic science. The science concerning these issues is rigorous, well documented, and replicated; moreover, it tells law enforcement not only what *not* to do in order to avoid miscarriages of justice (e.g., don’t do simultaneous lineups) but how to do the same tasks with much lower risk of mistakes (e.g., use sequential lineups). Yet, with the exception of DNA work, law enforcement has not embraced science. Most often, it has actively resisted science. The question at the center of Failed Evidence is why. If we can understand why, we will begin to understand what can be done to overcome this resistance, and how to have lasting change in the justice system. The book contains recommendations for creating this kind of change, as well as examples of situations from states in which breakthroughs have happened. To see short videos of David Harris discussing various aspects of Failed Evidence, click here.